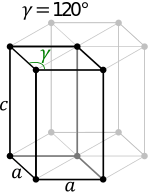 There are two orthorhombic Bravais lattices in two dimensions: Primitive rectangular and centered rectangular. The primitive rectangular lattice can also be described by a centered rhombic unit cell, while the centered rectangular lattice can also be described by a primitive rhombic unit cell. There are four orthorhombic Bravais lattices: primitive orthorhombic, body-centered orthorhombic, base-centered orthorhombic, and face-centered orthorhombic. In the orthorhombic system there is a second choice of crystal axes that results in a unit cell with the shape of a right rhombic prism, although this axis setting is very rarely used; this is because the rectangular two-dimensional base layers can also be described with rhombic axes. 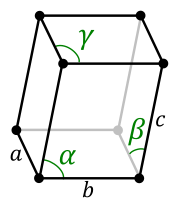 In this axis setting, the primitive and base-centered lattices interchange in centering type, while the same thing happens with the body-centered and face-centered lattices. ↑ Prince, E., ed. (2006). International Tables for Crystallography. International Union of Crystallography. doi:10.1107/97809553602060000001. ISBN 978-1-4020-4969-9. 1 2 3 "The 32 crystal classes". Retrieved 2009-07-08. Hurlbut, Cornelius S.; Klein, Cornelis (1985). Manual of Mineralogy (20th ed.). pp. 69 – 73. ISBN 0-471-80580-7.